The scheme uses a credit system and the credit values allocated to each module are shown in the diagram above. 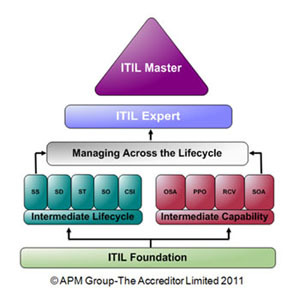 To be a certified ITIL® Expert, you will have to accumulate a minimum of 22 credit points, 2 of which must be from the Foundation module and 5 from the Managing across the Lifecycle module. The Foundation module is mandatory. When you complete and pass the Foundation exam, you will earn 2 points. You can then proceed with modules from the Lifecycle and/or the Capability stream. When you have accumulated at least 17 points, then you achieve the ITIL® Intermediate level. You can then proceed with the Managing across the Lifecycle module. Upon completion and passing this exam you would have earned 22 points and will be awarded the ITIL® Expert certification.